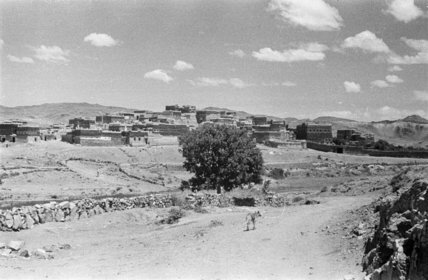 View of adobe and slate buildings in the city of Abha. In the foreground a dog walks down a road towards a tree. In the distance beyond a cluster of one and two storey buildings sits on a low rise beyond the road. The buildings are built with adobe bricks topped with parallel lines of raqf (slate) tiles.